I have been enjoying reading your website for a few months now and I’ve found you and the ladies who post comments both informative and helpful. But I do not know where to post my dilemma. See I, along with my sister inherited mum’s jewelry. 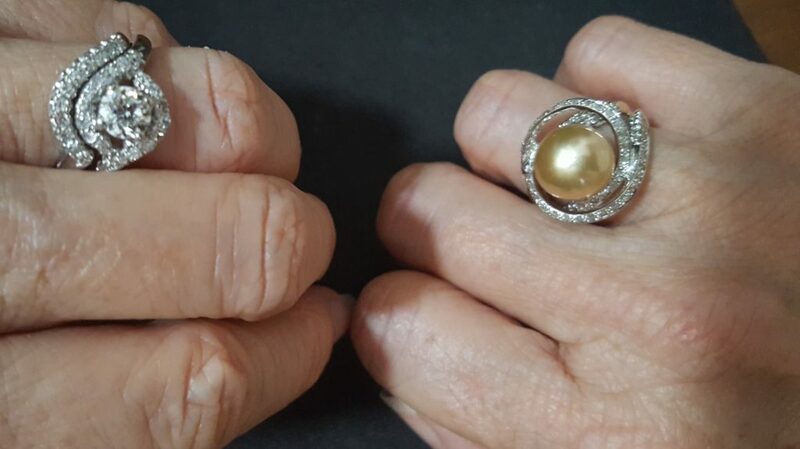 I’ve had them cleaned and valued and refurbished where necessary and resized for me and in one case remade (thanks to your wonderful advice about wearing not warehousing). I’ve even learned to take ownership of my left ring finger. I inherited my grandma’s and a much loved great auntie’ s solitaire engagement rings. I now wear them both at the same time. (My other half is not into jewelry so I always bought my own and my left hand has always been empty until now). 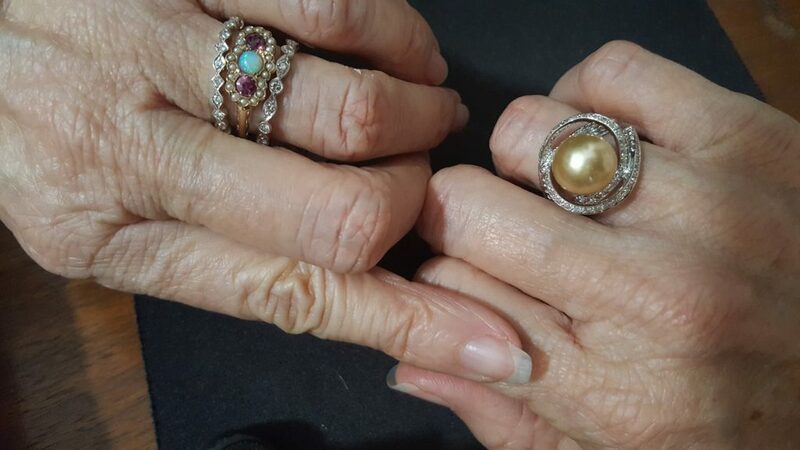 Anyway my inherited rings are beautiful and sparkly, but they were from depression era marriages so although not tiny, are of a more modest size. I must say I rather like them and I think of my grandad and my great uncle struggling away to save for these rings, and I wouldn’t dream of changing them because I enjoy wearing them as they are. 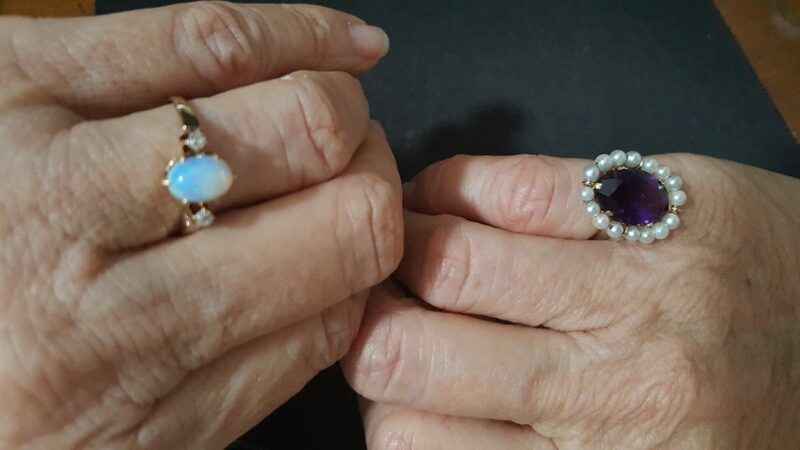 I think of all the ancestors of these ladies and also my great grandma (I had sapphires set into her wedding band, one each to represent each of her children) and I’m terribly grateful and honoured to be now wearing them. I have mum’s eternity ring from 1971. And an early 1980s emerald flower and diamond ring. I remember being at her side when she brought it for herself. I call these inherited rings ‘the ladies who lunch’ as I have quite a physical job I only wear rings in the weekend. Anyway…even though I’m quite a conservative person I tend to buy big modern rings with wide bands with a big look. 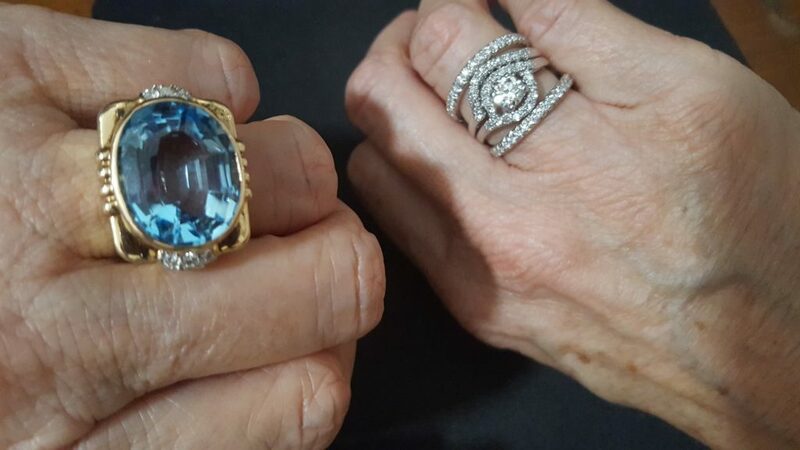 I love my vintage rings and I continue to shop jewelry in that modern style and my hands suit big rings. I want to wear my modern rings with the smaller vintage rings. When I tried to do this it’s hard not to overshadow the inherited rings. 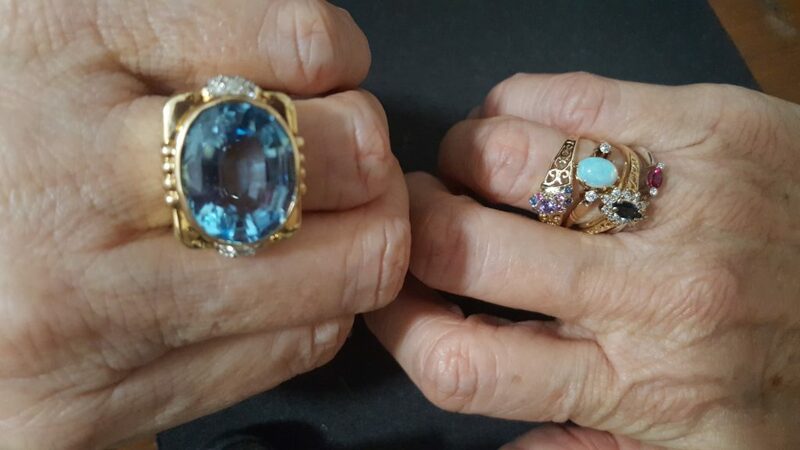 I have even purchased a couple of estate rings from the same era so I have something else to wear with the family rings, but that leaves my expensive beautiful big modern rings at home. 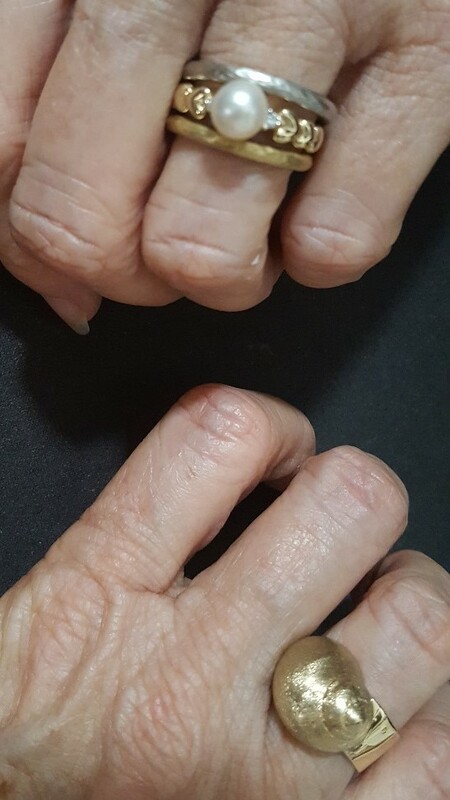 I have googled this issue, but all I find is advice for remaking inherited rings, but I love what I inherited just the way they are. So any advice about how do I mix and match? Or what modern style I need to buy to merge the eras together? I’m surely not the only person with this dilemma? 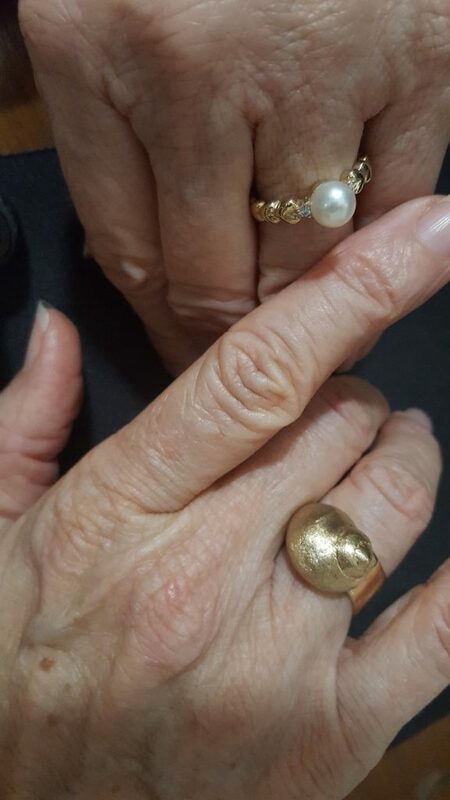 I’m so happy that you shared your story of your Mum’s and family rings and what you have done with them. They sound so worth wearing, especially with the history they have for you. 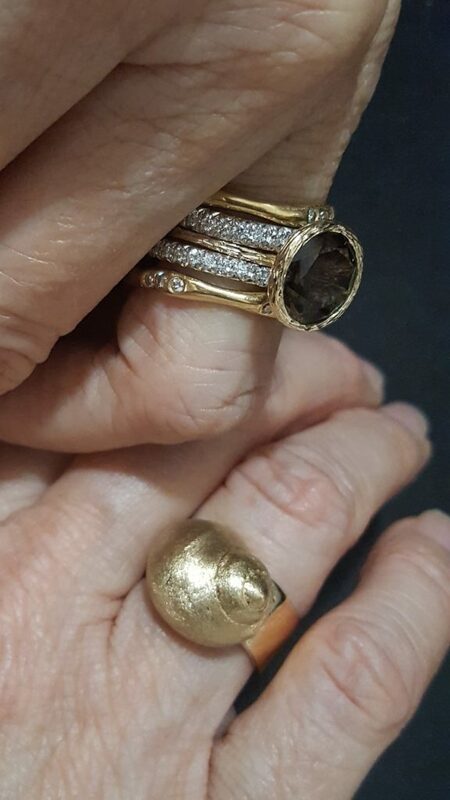 When I combine vintage and small rings with modern and large rings I use similarity in width to help create a balance. 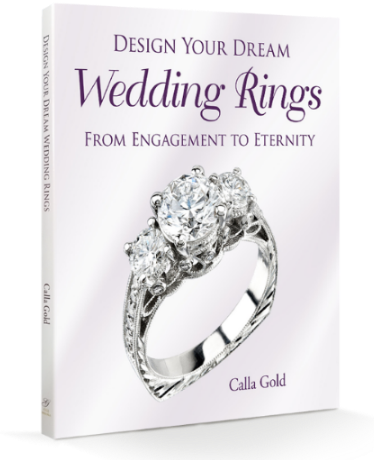 My favorite way to achieve this look is to either stack rings on either side of my tiny or vintage ring to create a bit of heft, or to combine dissimilar rings for a eclectic mix of color and style. By combining my tiny rings, I get a bigger look. Mixing simple and timeless stacking rings with vintage rings or modern designs gives you the choice to be quite artistic in how you dress up your little rings. 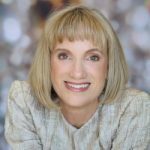 I dived into my jewel box for big and bold, and delicate and tiny, and vintage, and started playing and snapping pictures to share with you. When you are looking for mates to add to your little vintage rings, don’t be afraid to pair a more modern stacker with a vintage piece. If you love vintage and modern, and large and small, you can play around with some of these ideas and wear both with a flair.